This Saturday January 14th, 2017, the Seattle Seahawks will face their toughest test yet as they travel to Atlanta to face fellow NFC contenders the Falcons. The last time these two faced each other was back in October, and back then nobody would really predict that it would turn out to be the league’s best game of the season and we lucky fans get a rematch of it. In that week 6 game, the Seahawks edged a narrow and controversial win of 26-24 over the Falcons at home, the controversy which I can only assume is still a very sensitive topic in Atlanta, came as a result of a pass interference call that did not get made by the referees when Seattle’s cornerback, Richard Sherman bumped Atlanta’s wide receiver, Julio Jones during a late 4th quarter 4th down play. Honestly, I did not expect to see a rematch of that game in the post season, after all the Falcons were one of those up and down teams this season, and my faith in a post-season appearance by them was slim. But, here we are, and the NFC Divisional Playoffs are featuring the No.2 Falcons against the No.3 Seahawks. The Seahawks are trying to reach their third Divisional title in 5 season, but will have a tough time achieving this. I will say they looked very impressive last week against Detroit, most notably was the vast improvement on their running game. Thomas Rawls who all but absent in the three games prior to that one, got an astounding 164 rushing yards and 1 touchdown in 27 carries. And their air game was also impressive, Russell Wilson completed 23 out of 30 passing attempts for a total of 224 yards thru the air and two touchdowns. Defensively, Seattle gave a strong performance last week, containing the Lions to just 6 points in the entire game by way of 2 field goals. The Falcons on the other hand, are coming into this game with a 4-game winning streak in the regular season and they have had time to rest and heal which coupled with the home field advantage and that grudge from week 6 they must be carrying, has to give them a hefty advantage. 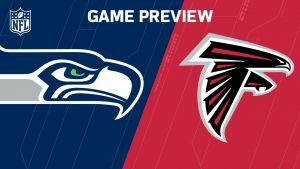 This sentiment is shared by the line gurus at AceSportsbook.com who have the Falcons as 4.5 favorites in this game, despite the impressive post-season history that Seattle has. Aside from the aforementioned reasons, there is also the Falcons defense, which happens to be the top-scoring defense in the league, averaging 33.8 points per game. Quarterback Matt Ryan has made it to the top of the list for MVP this season after throwing 11 touchdowns and no interceptions in the last 4 games of the season. Offensively, the Falcons are rocking, Ryan became the only quarterback in NFL history to throw touchdown passes to 13 different receivers in one season, this means the potential to outscore Seattle is not only possible but more than likely, especially since the Seahawks lost their defensive star safety Earl Thomas. As much as I’ve liked Seattle over the last few years, I have no choice but to side with the Falcons, I predict Atlanta wins by a score of 34-28.